Through WCI you will become a Certified Coach. 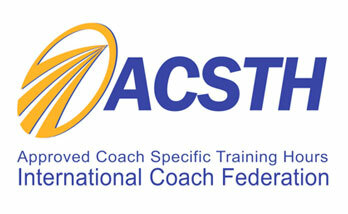 Some coaches decide to pursue an ICF (International Coach Federation) credential. You can choose to become an ICF Member for $245 per year plus 60 hours of approved training (which can be 48 teleclass or in-person hours + 12 self-study hours) instead of or in combination with your ICF Credential. About 40% of the 20,000 global ICF members currently hold an ICF credential though in 2013 the ICF awarded 25% more credentials than the year prior. All of our Foundational Teleclasses give you 48 ICF ACSTH Approved Teleclass Coach Training Hours plus even more self-study hours and our CCMC Teleclass contains 52 Teleclass Coach Training Hours; all of which are accepted by the International Coach Federation (ICF) for coaches applying for an ICF credential. 1. Select the credential category you are applying for above. 2. Complete the requirements including Coach Training (Certificate), Client Log (provided during training) & Mentor Log (provided during training). 3. Get your Recorded Coaching Session(s) together to be submitted with your ICF application. If you take WCI's Foundational Teleclass then no recording coaching session will be required for the ACC credential. 5. Once approved to do so by the ICF you will then proceed with Online Exam to be completed on your computer at home. 6. Receive your ICF Credential if you have met all the requirements. 7. Renew every 3 years following the requirements. Submission of the renewal application with appropriate documentation. Upon purchase, a link to the credential application will be forwarded via email. Participation in at least 40 hours of Continuing Coach Education (CCE), with at least 24 hours in Core Competencies. When applying for an International Coach Federation (ICF) ACC or PCC credential you need to obtain 10 hours of mentoring over three months from an ICF PCC or ICF MCC coach. 7 of these hours can be from a group setting. We firmly believe that you should be able to choose your ICF Mentor Coach. If you choose to sign-up with one of our ICF mentor coaches, we have arranged for you to receive a 30% discount on their 10-Hour Mentor Coaching Packages. The contract and payment would be directly with your chosen coach. Read more about the coaches and their packages.